At last, the Founders Program is about to start and the basic website is now live! We are desperately trying not to spoil anything about the game but at the same time we want Star Control fans to feel reassured that we’re on the right track. It’s a delicate balance. Stardock built a new studio, from scratch, in Towson Maryland specifically for Star Control. We knew Star Control would require a veteran team to nail and for that reason decided that it was best to build the studio in Towson Maryland. Why Towson? In one of the quirks of the game industry, Towson Maryland is ground zero of a good chunk of the PC game industry. Firaxis is here. Bethesda is here. Big Huge Games is here. Zynga was here. So much PC game history was made in this little town (Microprose and its successors). Stardock has a single office complex to house Stardock Towson, Mohawk Games, and Oxide Games. This has had some really positive results that we didn’t consider at first. For example, Soren’s team (Soren designed Civilization IV) working on Offworld Trading Company has had readily available early testers while we’ve ramped up while Andrew’s team (Star Control) has had readily available access to art and game design input from Soren’s team. And of course, Oxide Games, the team making Ashes of the Singularity, is there to help with the engine. So it’s using the Nitrous engine which is being developed for Ashes of the Singularity. 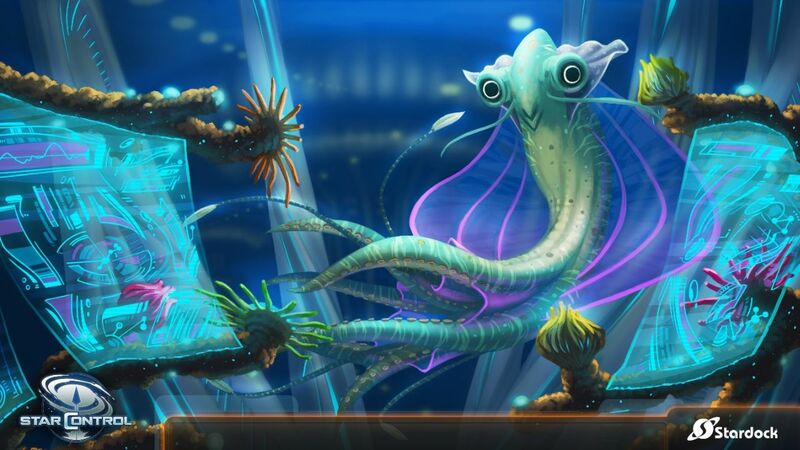 Star Control will be 64-bit and require at least DirectX 11. This won’t be a big deal when it ships but it’s something to be aware of. We’ve made some core design choices (Super Meelee will support up to 6 players in MP mode). While we’ve left other decisions (how many ships should be present in a Super Meelee battle) for the Founders to have input on. The engine, of course, could support thousands of ships in a battle. That’s not the issue. The issue will be the gameplay and what makes sense. If you’ve seen Inside Out you have a good idea of what the general art style will be like. Mind you, we picked our art style before that movie came out, so we’re not basing ours on that movie, it just kind of worked out that way. When you explore the galaxy, the planets won’t look like realistic planets. They’ll look like the above. That’s because when you land on a planet, there’s no transition. You are literally landing on THAT planet and exploring (obviously super zoomed in). While it’ll be similar to what was in Star Control 2, it’s heavily expanded upon (first, because it’s 3D and you’re driving around on a sphere-ish thingy, secondly because you’ll find special items in addition to resources). This is the piece we’ve really struggled with in terms of “spoilers”. Other parts are easy to not mention because we don’t want to give away too much. But we think this part is important to get out early on. If you go back and play Star Control 2 the challenge has always been about replayability. Now, you can always create “sequels” that continue a story but then that means you’re waiting until a sequel which isn’t super satisfying. We toyed with this a bit with Stellar Frontier a long time ago with fantastic results. The idea being that OUR story will take place in our dimension (Earth-1, 2085). But the community will be able to create their own stories, aliens, ships, etc. with the tools we’re making. This sort of thing has helped games like Skyrim and now Fallout 4 a great deal. But what if a game was designed from the start with this in mind? Imagine loading up the game and being able to choose to go to “Earth-76” or “Spazik Universe” or whatever dimension someone comes up with? Obviously, this is a win-win for both us and the players. I’m not going to pretend that making these tools won’t sell a lot of copies of the game. But it is also a no-brainer to do. Players aren’t in the situation where they “finish” the main campaign and wait a year or two for our next edition. Instead, they logon and there’s a bunch of things. Obviously, for the Super Melee enthusiasts, this won’t mean much. They’ll just be playing in their 1 on 1 up to 3 on 3 (or any combination in between) and competing in a quasi-MOBA style game. Our Super Melee will be action oriented (so we might as well get that out of the way, it’s not going to be a strategy experience). But we have the advantage of being designed where we can say you need broadband to play it online. This looks great! Can't wait to be apart of the program. While other gaming hubs come and go, Towson will silently churn out the games and people that go "Wow I want to make video games!" Especially thrilled by the news that the authoring tools will allow us to design aliens, which was a question that's been on my mind all along. It's rather straightforward to design ships, but creature design is much more challenging and if players have an easy way to bring their own species to life in an even somewhat convincing way, it's going to be terrifically fun to see what people come up with. Also really digging the new look of the forum to coincide with the debut of the new concept art. I am so excited to see more. I will probably come to Towson and beg if you don't let me in the Founders Program! The way the universe/galaxy was portrayed in Spores was cool too. Those planets reminds me a lot like Spores. The planets look good. Maybe a few Cybertron like planets would be cool. Great work Star Control team! Loving the progress reports! There's only one issue I see here. I like the art. I like it a lot. That new alien is a masterpiece all on it's own. Then you add the environment it's swimming(?) in and it just elevates the composition to an entirely new level of awesome. But then I see those planets and I get so sad. One of my favorite activities in Star Control 2 was going to the planet, and just admiring how pretty and random and procedural and realistic! Someone mentioned Spore above. 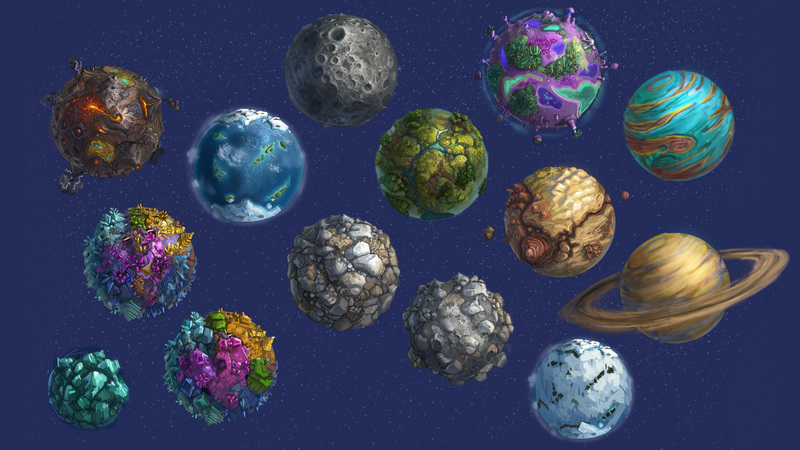 For good reason; those planets and the planets in Spore are look-alikes from what I can see here. I loved spore! It was a great game! But the art style between the aliens and the planets and the rest of the environments all matched up. It was a sort of cartoon like quality. Here, I feel a disconnect between the art style for aliens and planets. I know, I know, StarCon2 had cartoon aliens and semi-relaistic planets. But even as cartoons, those original aliens were explained and understood and lore-ified. They were, to me, actual biological organisms/rock beings. They lived on actual planets. I would much rather have a realistic looking planet to look at than these nice, but disconnected ones. I don't know how others will feel about it, but that's my two cents. I really can't wait to see when the founders program is a go. I love that you're all keeping us up to date on progress. I love that you're including (at least some of) the fans and trying your hardest to make this a game worthy of the name "Star Control!" Also, that Icon and title are amazing. Looking good. One question, would there be any challenges in taking the alien images and using them in GC3 and vice-versa? @billia the planet's pic is just a concept art pic. As it's mentioned in the post - all is 3D. I'm sure the disconnect you're talking about isn't actually there. The Alien looks spectacular!! If it's all animated and like you mentioned Civ 5 style where you can show the character's emotions..... I'm speechless. Could not have asked for better!!! I still have an idea to improve the look of this alien - make suckers hexagonal or even tetragonal - more alien. "When you explore the galaxy, the planets won’t look like realistic planets." ^ But the aliens don't look "realistic" either. I think the cartoony art style of the alien and planets match nicely. Do you think this matches the alien image better? OH DEAR JESUS. I can't actually believe that alien! It is so perfect and glorious and creative and non-humanoid, I can't even tell you how happy I am right now. It looks like my wildest dreams on a computer screen. Completely alien and amazing in every.single.way. And the planets!!! OMFG! I WANT TO GO THERE! TO EACH AND EVERY ONE OF THOSE, BRAD! It's like you guys snatched them from my imagination that I'd composited over the last 22 years and made them real. I am astounded, amazed, and bewildered at this art direction. At the risk of sounding like a fanboy, I just have to say - you guys are perfect. I can't take it. It's perfect. No, I dont expect HYPER-realism. I just think the planets in this post are a bit too cartoonish. I'd rather see a planet-like object and have loading screens than have these clumps of clay and seamless travel. These planets look nice, don't get me wrong, I just don't think they fit my own interpretation of Star Control. ^ Exactly what I said earlier. It's just a 2D concept art. 3D model of a planet will look better as in MUCH less cartoony, more life-like/real. Trust me, I'm a 3D modeler. Haha, okay then! You've abated my concerns. I'll have to wait for more art to be released t see what you mean though. I'm a voice actor, so not exactly fluent with 3D modeling. PLEASE leave those planets alone!! ^ Don't you love that evolved Orz guy.... girl........ creature. The art direction is straight on point guys. Can't wait for more of it. 6 player action oriented Super Melee? Sounds great, so far. The mention of MOBA, though, makes me worry as to how the ships will be controlled. I cannot confirm or deny the name of the alien at this time. I can only confirm that he is very cool. Also the Star Control logo on the space background was done at desktop wallpaper resolution.